Block Engineering's LaserSense-ML is a hydrocarbon (C1-C5) gas analyzer for mudlogging and related oil and gas applications. The Quantum Cascade Laser-based system measures hydrocarbon gases from ppm level to percent level, allowing for both sensitive detection and a large dynamic measurement range. In mudlogging gas analysis, speed, accuracy, and uptime are critical. Drilling speeds have increased to the point that current Gas Chromatography (GC) analyses of the evolved gases have become a bottleneck for geologists. The LaserSense-ML provides a clear alternative to traditional GC and GC/MS solutions, allowing for much quicker readings (10 seconds or faster), no costly consumables, and very little maintenance. When deployed directly at an oil drilling site, a QCL-based system allows critical decisions to be made faster and more reliably than ever before. The LaserSense-ML is ruggedized such that measurements are not affected by vibration, allowing the unit to operate at 100% duty cycle. A pump and pressure sensor can be integrated to provide continuous monitoring in under- and over-pressure environments, and the entire gas handling path can be heated to reduce condensation of heavier hydrocarbons and water. 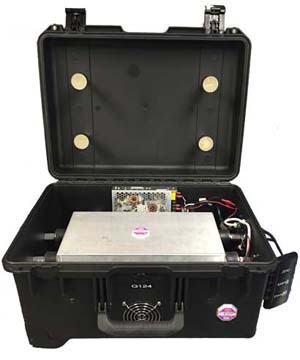 Lasers are eye-safe, and the unit is available in Pelican, NEMA 4x, and explosion-proof enclosures. Download a detailed specifications sheet for the LaserSense-ML (PDF). If you would like to discuss how the LaserSense-ML can help with your application needs, please contact us.